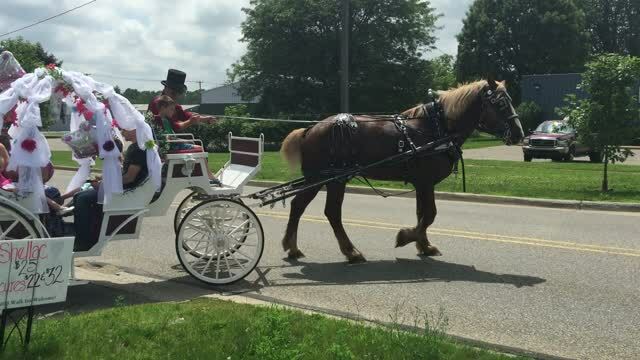 Come experience the enchantment of Marshall, Michigan, aboard one of our horse drawn carriage tours! Step back in time and experience the beauty of the largest Landmark Historic District for an urban area in the United States. When on a carriage tour, Marshall Carriage Company guarantees not only a great time with a great guide, but that any guest will gain a new knowledge and appreciation of the abundant history Marshall has to offer. Your carriage ride will take you downtown, through the historic district of Marshall's northern neighborhood and around the fountain. Carriages are available for private parties anywhere within Marshall. Call for pricing. Bundle up for your Christmas tour. Getting ready to the day's work. Book us for your personal Princess party or other special event! The horses would love to come celebrate your birthday party or wedding with you. Princess Party at Vintage Vixens Beauty Parlor.